First, you’re going to need a place to build your new home. Many builders have a realtor or a salesperson who can assist with finding you the perfect lot and usually at no extra cost to you. It’s a service they provide as it gets them closer to the opportunity to build with you. Every piece of land is different, here are some things to consider. Your builder can help manage these things and set expectations depending on the lot you choose. They are the expert, so it’s always good to get their insight before you make an offer. Acreage Lots – you may need to drill a well for water, test the existing well or connect to the county water. Other costs may include a septic system, driveway, tree removal. Inner City – there may be a home on the lot which needs to be removed. Some costs that can come up include: asbestos testing, asbestos remediation, demo, move/sell the home, shoring (holding up the neighboring lots from caving in), road repair, underground services, tree removal. New Community – typically the developer has hooked up water and power to the neighborhood. Many builders will have in-house designers or ones that they contract work with. You can begin design using their designers usually with a design deposit. You are not necessarily tied to the builder if you choose to begin the design with them, check the deposit contract form. The deposit typically gets you a full set of plans. The benefit of working with your builder or builder’s salesperson through the design process is they can help monitor costs and provide insight on ideas from a construction perspective. Design starts with a main and upper sketch (if you have a two storey home), then continues to exterior elevations and basement layouts. Timing can take anywhere from 1-6+ months depending on how clear you are on your dream home. The tender set is a set of plans with more details. Once you have agreed upon the structural elements of your home, the designer will begin completing the tender set of plans. These plans can be sent out for pricing. Before moving to tender set, it is important to sit down and walk through your plans to confirm everything is as you want it. The tender set of plans is sent to Trade Partners and Suppliers to get up to date pricing for your home. You can have different builders price your home if you are looking to compare pricing. It is important to make sure you are comparing apples to apples, so having a clear understanding of each builders specifications (what materials they are using and including to build your home) will help you get an accurate comparison. Pricing is presented as a fixed price or cost plus. You can read more on that here. Once you are satisfied with plans and pricing, you will enter into a contract with the builder. The contract will break down what each of you is agreeing to. Make sure your builder goes through this clearly with you. Depending on your area there will be different permits and approvals that must be met before construction can begin. 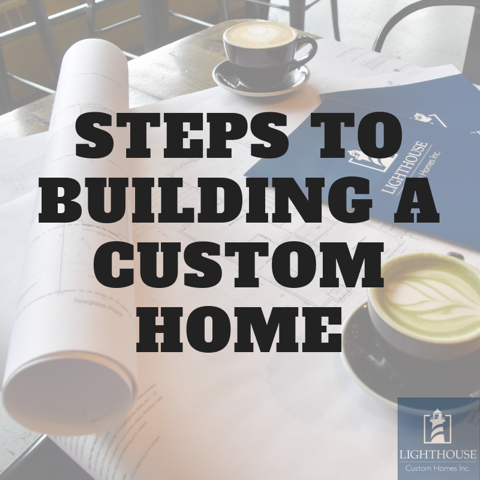 Your builder will typically handle this process for you. Before construction begins, you will complete all your interior selections. These are the finishing details including tile, paint color, hardwood, carpet, trim color and much more. Your builder will assist you in making these decisions. Some people choose to work with an interior designer at this stage to make sure they are making decisions that match their vision. In Alberta, there are different warranty programs, but they are all required to match the 1, 2, 5, 10 year warranties. One year builder’s warranty, two-year distribution systems, five-year building envelope, ten-year structural. You can learn more about the warranty program here. To Renovate or To Build?